The Next Big Thing From The Makers of Brutal Legend is... Sesame Street? They've made games featuring heavy metal funny man Jack Black and talking Russian stacking dolls, so what's next? The monsters of Sesame Street of course. 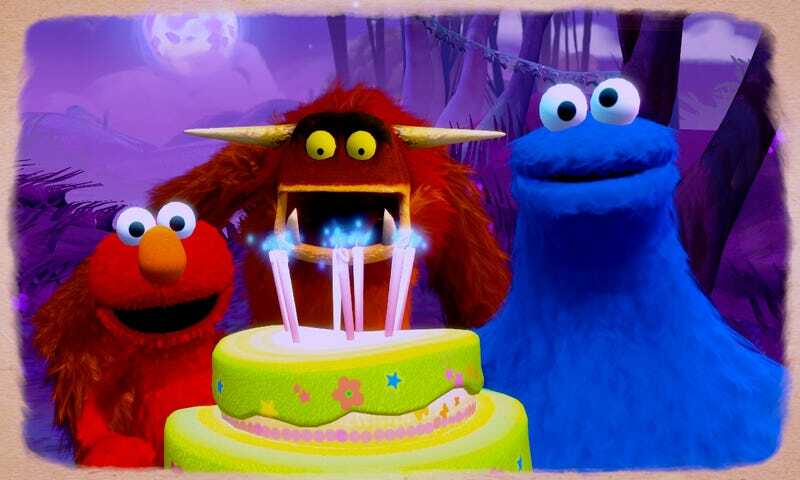 With the help of Xbox 360's Kinect, Sesame Street: Once Upon a Monster lets gamers join Cookie Monster, Elmo and other Sesame Street characters as they explore a "living storybook" entitled Once Upon a Monster. In the book, they make new monster friends and share in their adventures, solving problems, forging friendships and learning key life skills along the way. "Parents and children literally become part of the whimsical storybook adventure by getting active together through dancing, jumping, flying and more," according to the, perhaps, overly literal press release. "It's great to be working with Warner Bros., especially on a game like Sesame Street: Once Upon a Monster, which brings together so many things we all care about," said Tim Schafer, President and CEO of Double Fine Productions. "Sesame Street had a profound effect on me, and many members of the Double Fine team, when we were children. So did video games. Now many of us are parents and we want to share with our kids the great experiences we had, but also the completely new ones made possible by cutting-edge technology like Kinect for Xbox 360. So it's a labor of love on many levels." I wonder if this counts toward one of the "micro games" that Double Fine came up with while taking a break from making huge games?